Darn it, shoulda used extra-firm tofu. I think Rich and I broke a holiday party record yesterday: four parties in nine hours. And the food. Oh boy, the food. Highlights include warm ricotta dip, fig and caramelized onions on parmasean tarts, Swedish meatballs, homemade marshmallows, roasted Brussels sprouts, two separate brie en croutes –all warm and melty with caramelized onions and cranberries spilling from underneath their puff pastry shells — a divine cheese platter and rich chocolate ganache cookies. I also drank some wonderful homemade merlot and was introduced to a fresh cranberry and vodka drink that needs further exploration. So it’s no surprise that Rich and I woke up this morning still pretty full, and a little, just a little bit, grossed out by how much food we ate yesterday. So tonight I turned to my favorite dish I cook up when I think we need to hit pause on our holiday eating. This recipe is adapted from Mollie Katzen’s Still Life With Menu Cookbook. 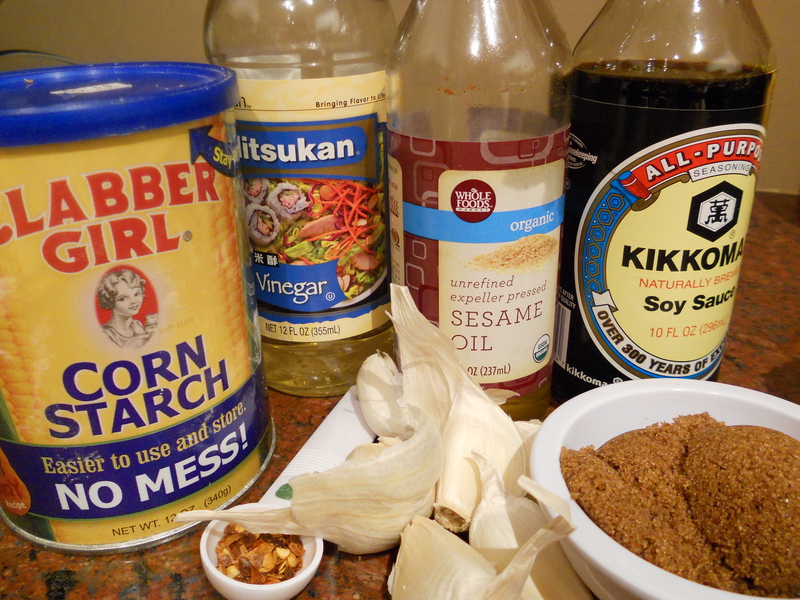 I’ve found her original recipe to be too vinegary and lacking in soy sauce, so over time I have rejiggered it. She also calls for water chestnuts, which I never seem to have on hand, although last time I made this, I tossed in a can of baby corn. The dried black mushrooms are a pantry staple, thanks to Ocean State Job Lot. 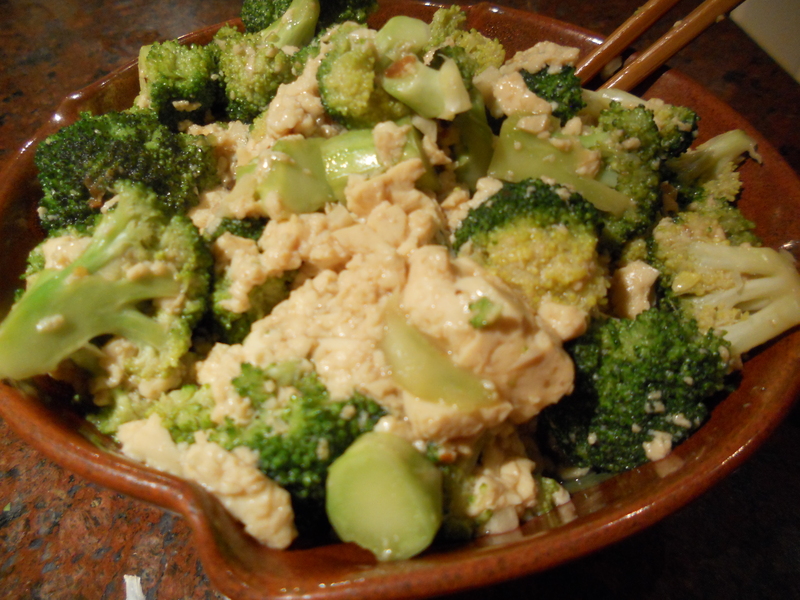 Tonight I added a block of medium firm tofu, although looking through the photos, should have been extra firm. Nonetheless, it still tasted great. The red chili flakes give it a good kick, so if you think it’s going to be too spicy for you, just use less than a teaspoon. Rich loves the extra kick and even adds Siracha sauce to his. Helpful hint: Put your rice on as you start to collect the ingredients, and it will be warm, ready and fluffy when the dish is done. 1) Place the dried mushrooms in a bowl. Add boiling water, cover with a plate, and let stand at least 1/2 hour (preferably a whole hour). Drain the mushrooms, squeezing out all excess liquid. (You may wish to reserve the soaking water for soup stock.) 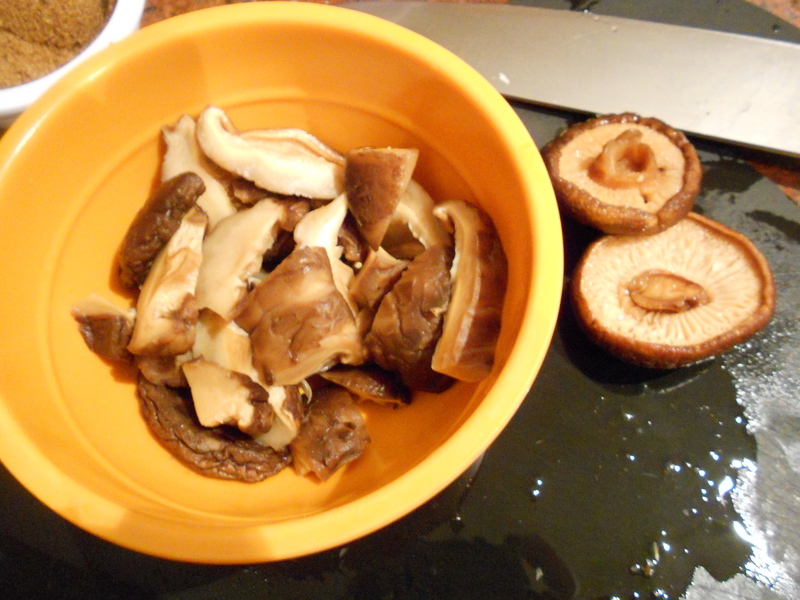 Remove and discard mushroom stems, and slice the caps in half. 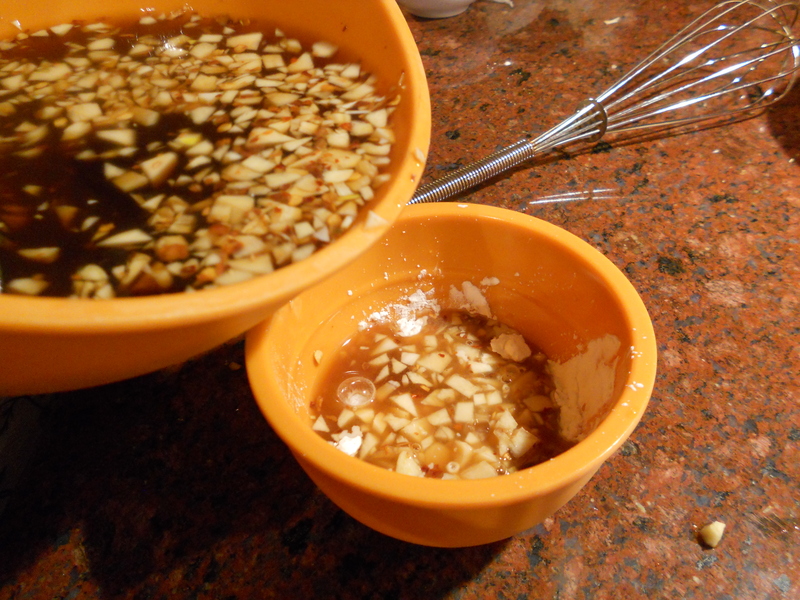 2) Combine the vinegar, 1 1/2 cups of water, brown sugar, soy sauce, salt, garlic and red pepper in a bowl. 3) Place the cornstarch in a small bowl. Add some of the sauce, whisk until dissolved, then return this mixture to the rest of the sauce. Leave the whisk in there; you’ll need it again. 4) Have all ingredients ready and within arm’s reach before starting the stir-fry. Place a medium-large wok over high heat for about a minute or two. Then add the oil. After about a minute, add the broccoli. Salt it lightly, and stir-fry for several minutes over consistently high heat, until the broccoli is bright grean. 5) Add the black mushrooms and water chestnuts, or tofu or baby corn, and stir-fry a few minutes more. 6) Whisk the sauce from the bottom of the bowl to re-integrate the cornstarch. Pour the sauce into the wok, turn the heat down just a little and keep stir-frying over the medium-high heat for another few minutes, until the sauce thickens and coats everything nicely. Serve immediately, over rice.